A 6 digit passcode is required for all users to access the AV presentation systems in the general assignment classrooms supported by Classroom Media Support on the UW Madison Campus. See the Classroom Information menu above for a complete list. Instructors and other users of the classroom AV systems can obtain an AV Passcode by viewing our tutorial and submitting your campus information in the Passcode application form at the end. You will need a UW Madison NetID. The tutorial will take about 10 minutes and will show you all of the basic functions of the General Assignment Classroom AV systems. This tutorial is NOT designed for mobile devices. Please use a desktop computer or full-size tablet to complete this tutorial. Temporary passcodes may be given out for one-time use in extrodinary cirucmstances. Temporary passcodes are only valid for one day. To receive a temporary passcode, contact us by using the classroom podium helpdesk phone, use a cell/landline phone to call us at 608-890-4900, or email us at av@fpm.wisc.edu. Only UW faculty and staff are allowed to retain keys, all student groups and Union events must check out keys from their respective organization. You will need a key to open the podium doors to access the cd/dvd/vcr, document camera or microphones. 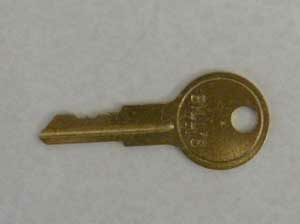 The key will work in all of our classrooms and is yours to keep for as long as you teach here. Please send the key back to us when you retire or leave UW Madison. These keys do NOT open the room doors or building doors. During normal building hours, the room and building doors should not be locked. We do not have keys to room or building doors – if you need building access contact the department administrator or building manager. To request a podium key, send email to av@fpm.wisc.edu with your campus address, call us at 890-4900, or visit us at our offices. To learn more about Lecture Capture and to receive authorization to use LC, please complete the Lecture Capture online tutorial. Once you’ve completed the tutorial, you may immedietely begin using Lecture Capture. Before beginning the Lecture Capture tutorial, you MUST have completed the AV System Tutorial and received your AV system passcode! Start the Lecture Capture Tutorial!